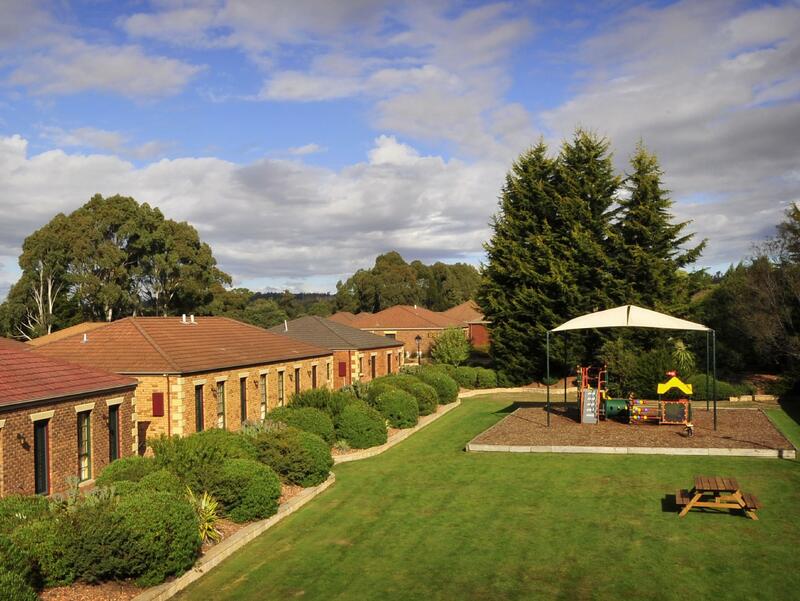 يقع Country Club Villas Launceston في South Launceston, لاونسيستون, هو خيار شائع بين المسافرين. يمكن من هنا للضيوف الاستمتاع بسهولة الوصول إلى كل ما تقدمه هذه المدينة النابضة بالحياة. بالنسبة لمن يريد الخروج، هذه بعض المعالم السياحية المتوفرة للزوار كاتاراكت جورج شيرلفت, ‪Cataract Gorge Reserve‬, كاتاراكت جورج. إن الخدمات الممتازة وحسن الضيافة العالي في Country Club Villas Launceston تجعل إقامتك تجربة لا تنسى. إن واي فاي مجاني في جميع الغرف, خدمة التنظيف يوميًا, مجهز لذوي الإحتياجات الخاصة, مرافق مخصصة لذوي الاحتياجات الخاصة, تخزين الأمتعة هي جزء فقط من الخدمات التي تميز Country Club Villas Launceston عن باقي الفنادق في المدينة. تنعكس أجواء Country Club Villas Launceston في غرف الضيوف.تلفزيون بشاشة مسطحة, اتصال لاسلكي بالإنترنت, اتصال لاسلكي بشبكة الإنترنت (مجاني), حوض الاسترخاء, غرف لغير المدخنين هي بعض الميزات الموجود في العديد من الغرف. يمكنك الاستمتاع بالأجواء المريحة التي تقدمها مركز للياقة البدنية, ملعب جولف (ضمن العقار), حمام سباحة داخلي, سبا, ملعب تنس طوال النهار. إن Country Club Villas Launceston هو خيار ذكي بالنسبة للمسافرين إلى لاونسيستون، بما يوفره من إقامة هادئة ومرحة. We got a large room, that was very tidy and clean. This is perhaps my fourth stay here over the past 2 years. Problem, the airconditioner leaked, the toilet had a small leak, but the most frustrating thing is the internet connection. It simply does not work. This stay and my previous stay in October 2014 it has not worked and I had to revert to my own wifi. Very good location, it's only 10 mins from city center, rooms are spacious, quiet place, good for family. We only stayed one night, but it was very clean, spacious, and nicely appointed for the money. The on site restaurant/cafe was excellent, and we had a takeaway pizza back in our room. The whole place had a very homely resort type atmosphere, but you do need a car as the location is out of town. It is split up from the Casino part which is up the road. Didn't have time to see that. Will definitely stay there again next time we visit. I flew in from Launceston, so this was good base to explore launceston area. This has several dining options onsite, we tried the pizza which was good. Took a swim with kids in heated pool which was excellent. There was also a basketball court. Toilets are huge and rooms are clean. Enjoyed the stay, good value for money. On arrival receptionist very professional n when I went down to have a night cap at the bar very friendly welcome n service. Room was surprisingly huge, love the villa-style vicinity with parking right in front of the doorstop and eateries nearby. Room was comfortable, spacious and clean. Friendly and helpful staff at the reception desk. Would love to stay here again. liked the bus service at call from Villa to main club house and back again. Swimming pool was clean and small selection of gym equip at Villa. Restaurant was a little slow at Villa, the buffet selection at the Club house was good but desert buffet had little variety. One of our favourites property to stay during our 8 day trip to Tasmania. 2TV although the TV in the bedroom has limited channels. Overall ambience of the property & service - good. Only 15 mins drive to airport which is great when we need to catch an early flight. Supermarket is short drive only. Had problem with wifi & the kind gentleman at reception loan us a modem. staff were friendly and accommodated our request to dine at terrace restaurant. The boys 2 and 7years loved the playground and pool. Great service and lots of dining options. A shuttle bus takes you to the casino and wait time always less than 5 mins. Great base to explore launceston if you have a car. It was not bad overall relative to the price charged. The room itself can occupy 4 of us. There is a free car park just nice outside each villa which is very convenient. I would recommend it to anyone visiting Launceston with family or in a group. location, peaceful, parking right outside your door. We found the staff to be very friendly. The ability to park vehicle right outside room advantageous with luggage etc. Quiet and private area outside room. Close distance to the City for dining/shopping. Our accommodation was good, bed very comfortable,the pool area was nice and under cover. We enjoyed eating in the Bistro, good range of choices . On check-in we were told that they had a few problems with there internet and offered to move us if ours was not working, but it was fine. I would be happy to stay there again. Massive bathroom housing a spa, shower and a double sink. King size bed. Quality fittings. We were welcomed by friendly efficient staff and given clear directions to our Villa Unit together with a Map. The kitchen was well appointed and had all the appliances necesary to produce a meal if required (hotplate, microwave, toaster and utensils). The bathroom was massive with a spa, double shower and double sink. All fittings were of high quality. The bedroom included a quality Kingsize bed and a separate valet room for storage of suitcases, clothes etc. The unit backed onto a golf course and included a table and chairs in a shaded area amongst the trees. The whole experience was nothing but positive. The Villas are located in Prospect, a suburban area but with rural surrounds. The CBD of Launceston is about 10 minutes drive away. The Villas have 2 restaurants on site - Bolter's , a bistro and pizzeria, and Villa Italiana an Italian restaurant with a very reasonably priced menu.There is also a swimming pool, tennis courts and a golf course. Our unit was part of a terrace row and was very well equipped with one bedroom, a kitchenette, a lounge area and a spacious bathroom. All was very comfortable, clean and well maintained and the kitchenette had a microwave, a small 2 element stove top, plenty of cooking utensils, crockery and cutlery. My only small complaint would be that the fridge was so full of mini bar treats that it was hard to find space for our own things! The lounge area had a TV (as did the bedroom) and also contained a fold down bed cleverly disguised as part of a cupboard complex. We also had a good view looking out on the golf course and spied some native hens and a few bunnies as well! I loved the bathroom - plenty of towels and nice toiletries on hand. So overall, an enjoyable and very pleasant stay. nice villas, surroundings is quite beautiful. with golf course, lots of birds and other animals there, great for family with children. we found small wild rabbit running across the garden twice- which made my girl excited! room is small but nice designed. in the living room there is a queensize pulling out bed, also can stay 4 adults i think. kitchenware is simple but enough to prepare simple meals abt 5mins driving from town, nice neighborhood!